Support Eric King » Eric King’s Birthday is August 2nd! Mark your calendars, Eric King turns 31 years old on August 2nd! Get together with some friends to celebrate, eat some vegan cake, and pass around a birthday card that will surely brighten up his day! There’s also Eric’s Book Wish List to check out if you have some extra cash this summer and could send Eric a book for his birthday! Please include your worst jokes and puns in his birthday card! In honor of Eric’s birthday please take some time and head over to the Support Materials page and check out the two new posters that are available. We encourage everyone to print them off and display them where they can be seen and talked about. 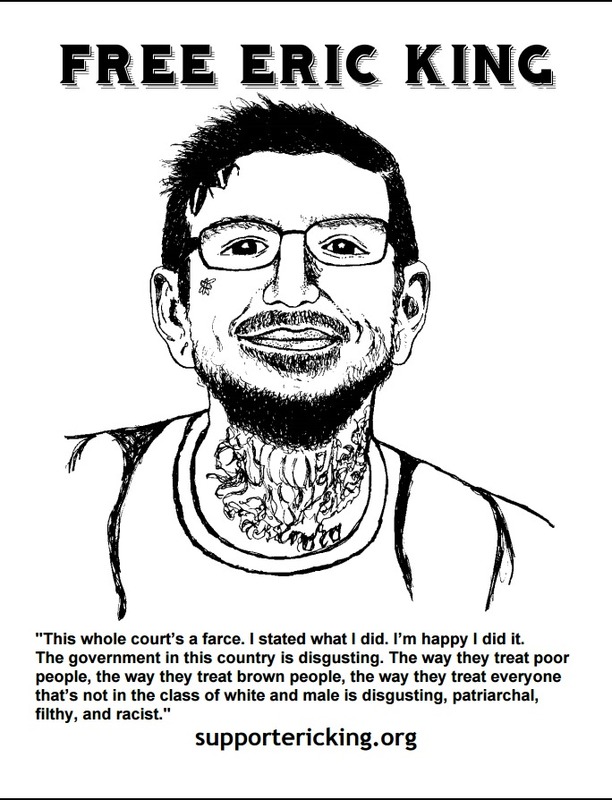 The more the hand bills and posters are distributed and displayed , the more we can all ensure that we can sustain a wide base of support for the remainder of Eric’s ten year sentence. Those who actively support Eric throughout the world as well as those who dare to take risks fighting the state not only keep Eric alive but keep the fight against oppression alive. 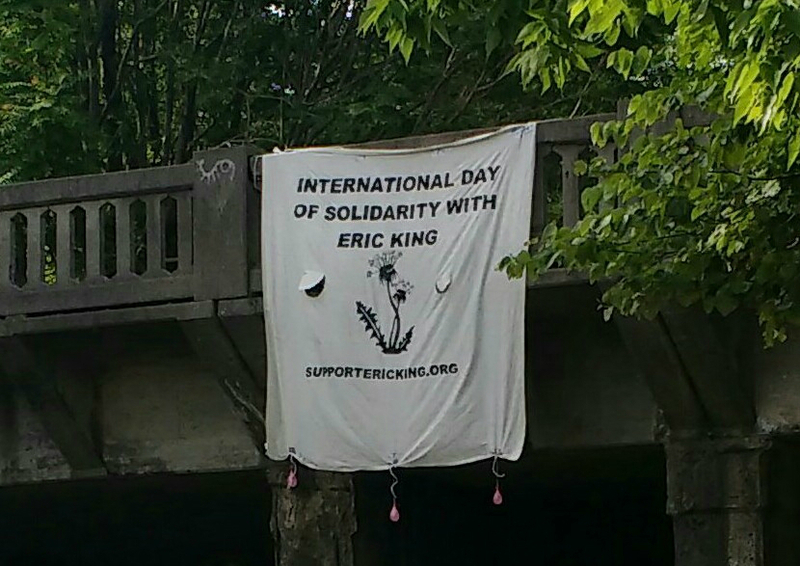 It was inspiring to see so many individuals take part in the first international day of solidarity with Eric King and hopefully that can continue to build momentum for supporting anarchist prisoners and all political prisoners being held captive by the state. Below is a beautiful banner that was dropped from an overpass in Bloomington, IN and could be seen on June 28th. Stickers were also put up in Canada as you can see here! 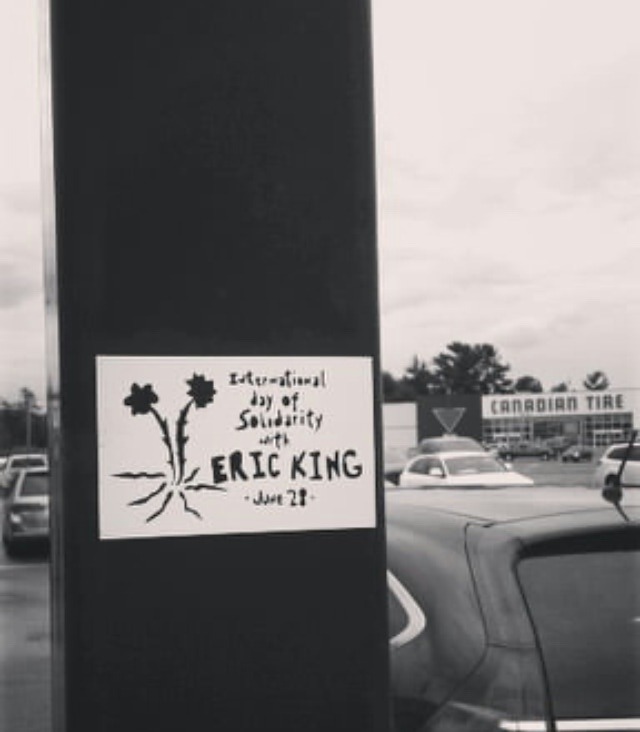 Also check out the report back from NYC and the banner drop in Denver, Colorado, all for June 28th, the international day of solidarity with Eric King. Thank you all for participating!! As we gear up to to make sure Eric’s birthday is a special one we acknowledge that he is one of many political prisoners held captive in the US, and we support all political prisoners. Thus, we want to let you all know that two other political prisoners have birthdays the same week as Eric: Bill Dunne, a long-time anarchist prisoner, has his birthday on August 3rd. Debbie Africa, one of the Move 9, has her birthday on August 4th.